The perfect sewing room is no longer just a daydream! 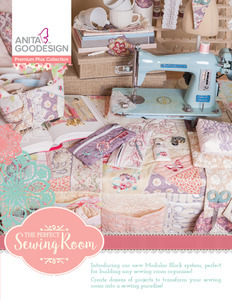 The projects in this collection will transform any sewing space into a sewing paradise! Introducing our new Modular Block system, perfect for building any sewing room organizer! We’ve provided pocket blocks, cinched pocket blocks, and zippered blocks that you can mix and match with any of the other blocks in this collection. We’ve even included blank block templates so you can merge labels onto the pockets! Don’t get your threads in a bunch worrying about the difficulty of these projects – every one of them comes with step-by-step instructions and material lists for happy stitching! Create your happy place with The Perfect Sewing Room (hoop sizes 5” x 7” to 9.5” x 14”).